Night Riots are an alternative rock band who have toured extensively since the release of their debut album, Love Gloom. The band has also released two EPs prior to the LP, as well as two singles from their sophomore album. 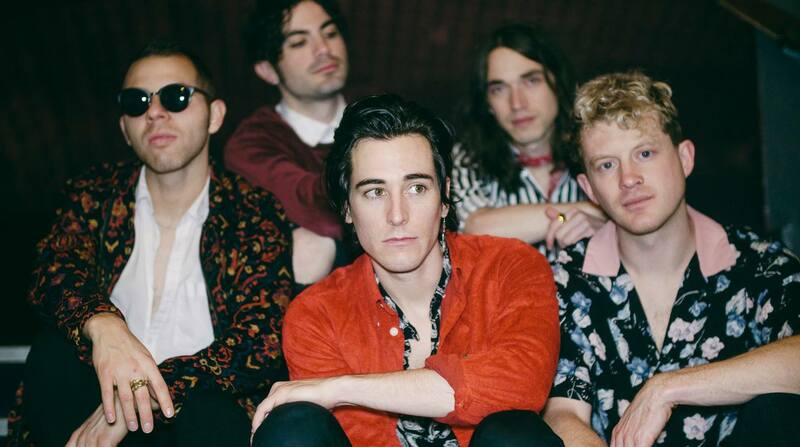 Last week, I had the chance to sit down with front-man Travis Hawley (front/center in picture) from the band Night Riots prior to a show on their Dark Violet tour. This interview took place at a small venue in Washington, DC where the band has played several times before, but this was their first official headlining stint. Travis talked about how they prepare for a tour and also their upcoming full length album. Thank you for the opportunity to interview you this evening. We’re here at U St Music Hall in Washington, DC where you have played on several tours before. What do you like best about this particular venue? I just like Washington. I like the energy here and when we play shows here, it’s always a little wild. Also, I think there’s something about U Street Music Hall that brings that out of people. You go down the stairs into this basement type of venue where it’s very tight with a low ceiling, and I always feel like people bring the energy each and every time we play here. And I’m sure you heard on the news that we (DC) recently won a hockey championship, so this city in general has been buzzing ever since. Yeah, it’s doing pretty well! Walk me through how you guys create a setlist for a tour. What did you change up (if anything) in your approach for the Dark Violet Tour? We always try and bring something new to every tour. We look at the entire process as a big performance, and we don’t want to give everyone the same performance every time. On this tour we have an hour and 15 minutes worth of music, and we don’t want to just play the songs in order, we always want to throw little bits in there to keep things exciting. That way the fans will walk away remembering all the little moments from the show. Tell me about the songwriting process that you have for writing new songs. How would you describe your evolution as artists? We’re always changing. You know, there have been songs that we’ve written where it’s been just the band jamming out together, and there have been songs that have been written that were just on piano or from a drum beat. The new songs have been interesting because we have written them part by part, with unique textures and it’s been a really fun process. Also, following those leads to the next phase of the songwriting process has been rewarding. You all have recently engaged with fans directly with several online acoustic performances and even a series of advice video casts leading up to this tour. Tell me a little bit about how you would describe your fanbase, and how you continue to find unique ways to keep them involved. We’ve been really fortunate. A lot of the bands that we’ve toured with and supported have had “real fans,” and by that I mean sometimes you’ll find a band where you’ll tour with them and you’re kind of asking where everyone is coming from. And, no one at the shows is really sure of why they’re there, ya know? And the next time that band comes thru town, no one is there. However, the people that we have played with have had the types of fans that show up at 12:00 in the morning and wait all day just to see that band play. So, that’s part of the dynamic of the fan-base that we have experienced. So, I think for us we try and give back as much as we can to our fans, but it’s difficult to keep them engaged, so we’re always doing different things like creating music, but we try as hard as we can to give as much as we can. Also, I’ve seen you guys on tour with several artists and musicians that you greatly respect such as Blaqk Audio with Davey Havok, tell me a little bit about the dynamic you have had with these other artists you have played shows with that you look up to. Going out on tour with Davey Havok, was…unreal. Especially since a couple of the guys in the band have grew up listening to AFI and our bass player began playing because of them. And AFI, is just one of those bands that have fans that are there for life. Additionally, another band we got really close with, a band called The Hunna from the UK, and Andrew McMahon in the Wilderness, and every tour we have gone on has had a different dynamic, different people that we really respect, and people that we can really learn from. And, that’s been the biggest thing, you walk out learning from these established artists saying “Oh, that’s how they do that” and the next band tour with, you learn how they do their set, and now we’re trying similar things with our set now that this our first official headlining tour. So now it’s kind of our turn to take all of these lessons learned and elements and put them in this tour and do our best. At the past few tours, I have personally witnessed covers of bands such as U2 (“Sunday Bloody Sunday”) and Tears For Fears (“Everybody Wants To Rule the World”). Additionally, you included a Patti Smith cover on the Deluxe Edition of the “Howl EP.” Do these covers come directly from your influences or do they happen more organically through jamming with each other over the years? That’s a good question. Yeah, I think a lot of these covers happen thru jamming together over the years. Other times, we’ll just be hanging out and someone will throw out an idea of a song to try, and then someone will bring it to the table with a style that fits us. Then we’ll learn those parts and start performing it. And, you’re going to hear a couple more (covers) tonight. Let’s shift gears a bit to the new album that you are working on. How close is your second full length album to being finished? Do you have an album title in mind? Who is producing/mixing the new record? It’s close. It’s very close to being finished. We are kind of going in to the studio and recording different parts at a time, and working on fine-tuning each song and carving it out. So, after this tour, we should be getting back into the studio and wrapping it up. Fingers crossed, we are looking at a Fall release. We don’t yet have an album title in mind. So how does that typically work when you create an album? Do you title in the beginning, do you wait until the end? It kind of just “appears.” It’s kind of like song titles, however an album title just feels different. I feel like I kind of need to get to know the songs better before I can name this batch of work that we have created. Also, to touch upon another question I had prepared, the singles you have released recently in “Colour Morning” and “On the Line,” I assume those will be on the new album? Yeah, and our approach has been more open as of late with releasing tracks as we complete them and we’re just dropping those songs for our fans to have something new to identify with on this tour, and just so people can have them. We really want them to hear the new music and we’ve got some really good stuff in store for this latest album. And, we feel like releasing these songs is not pushing it too hard and we really do it for our fans. As far as the production on the record, Eric Palmquist produced it, and he lives in East LA. You have known each other for quite awhile, since Middle School, I believe? What are some of the weird touring habits each of you have that fans may be surprised to hear? Oh man, there really are so many. The funny thing for us is how many inside jokes we have. And, for all of us we think it’s funny enough to put some of these on social media, but our fans may not get it since it truly is an “inside joke.” Um, Matt snores a lot. Let’s see, I’m a night time shower person. Also, anything else you can think of over the years as you’ve developed as artists. For example, I’ve played in a few cover bands before and sometimes we’ll have a bad show where you just have to get through it to survive. Well, the one thing that I’ve been really grateful for is we’ve never had a mass exodus where everyone just…leaves. Because, we have played with bands before where that has happened to them. For example, there have been shows where some bands have played in a huge room and then just everyone just scatters and leaves. That’s my nightmare is having that happen to us. Luckily, we have been fortunate enough that it has never happened to us. What artists, past or present, have most directly influenced your musical tastes and how have these artists influenced your songwriting? Growing up, there have been a couple of artists that have put out things that are fast and emotional, everything from Blink-182, to Fairweather, and Saves the Day. And, other bands such as INXS, Depeche Mode, and Queen that have these great rockstars in them, such as U2. And then recently, there has been a lot of the great new hip-hop stuff that have really been breaking the format. For example, a lot of the huge ones such as J Cole, Miguel is a genius, and additionally Run the Jewels, I really like their aggressiveness found in their music. We are really drawn to artists that really make you stop and think. Final question: What message would you have for young and aspiring artists looking for their “big break” in their career? I’d say, it’s a lot of work, but it’s also very rewarding if you can keep at it. Also, if you’re able to write great songs, eventually someone will take notice. Thank you, Travis for your time, and have a great show!